Recently, the Providence Public Library received the archival collections of noted Rhode Island genealogist James Newell Arnold (1844-1927) from the Knight Memorial Library in Providence, which had housed the papers since James Arnold’s death in 1927. The James N. Arnold Collection is now part of The Rhode Island Collection. Stairwell, Providence Public Library. Always be sure to take a good look around; it’s a lovely old place. Photo by Diane Boumenot. Kate Wells of the Providence Public Library had clued me in to this last winter and recently let me know that the materials were now newly processed into an archival collection and were, essentially, open for business. It’s not completely trivial to access the collection (for instance, the boxes are stored on another floor from the Rhode Island Collection office and reading room), so I made an appointment with Kate for my visit. Here is the Finding Aid for the collection (it opens up as a pdf download). James Newell Arnold as a young man. I love this picture, he’s quite a handsome young man. Was he already suffering from the affliction that was noticeable later in life, something that caused him to rely on crutches? 3-59, “Photographs, James N. Arnold”, James N. Arnold Collection, Rhode Island Collection, Providence Public Library. In the course of a long life James N. Arnold followed his historical data collection interests with a passion. Although the Narragansett Historical Register, his gravestone recordings, and the Vital Record of Rhode Island, 1636-1850 were his most visible projects, he spent a lifetime studying historical claims and events, arguing and sometimes feuding with other historians (most notably, a long standing feud with the Rhode Island Historical Society), collecting books, stories and ephemera, and never missing an opportunity to disparage Roger Williams. One of the two card catalogs containing various indices to parts of the collection. I carefully studied the Finding Aid (see above) in advance and decided to focus on the records of the Arnold family. James Arnold never produced the formal Arnold genealogy volume that he, no doubt, planned to finish someday, although late in life he seems to have collaborated a bit with other Arnold researchers who did produce manuscripts or books (more on published works here). It was clear from my perusal that my particular problem has not been solved; time for me to figure it out myself. But I was grateful for a chance to check that out. These colorful gravestone collection index cards were, I think, compiled after James Arnold’s death, by volunteers. Kate Wells advised me that, with the vital records and gravestone work widely available elsewhere, the most likely source for some genealogy magic was one of the card catalogs that had accompanied the manuscripts, plus a set of genealogy correspondence folders that contained many inquiries, answers, and notes. I attacked the card catalogs with a pre-determined list and didn’t turn up much. The only work of James Arnold that seemed to intersect significantly with my needs were some early Smithfield/Cumberland families. But I would like to return and approach this again with more time to peruse the many letters on file. Arnold’s weather diaries, kept for many years, plus some farm accounts. Box 4, “Weather journals”, James N. Arnold Collection, Rhode Island Collection, Providence Public Library. The documents are ordered and filed in boxes. 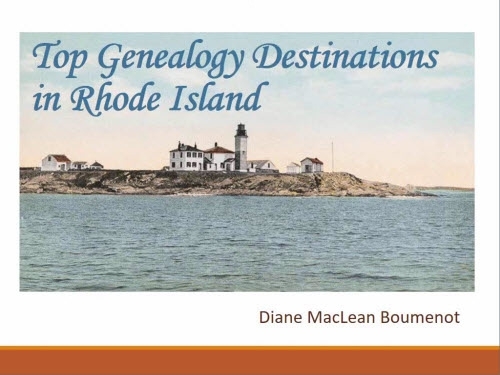 Genealogy notes on many Rhode Island families, tombstone recordings, Arnold family notes, historical as well as fictional stories, clippings, correspondence, account books, annals of war — there are many possibilities for research here. You just don’t know what you’re going to find among the many boxes and folders. I enjoyed my journey into James Arnold’s world and intend to keep studying his work. I was thrilled to find the original newspaper clippings of Harriet James’ work on my Andrews family. 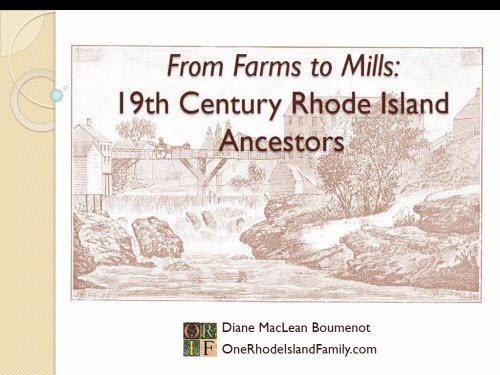 The genealogy work on Rhode Island families was a hodge podge of copied notes, essays, clippings and abstracts, but was definitely unique and valuable. I will revisit those. James Arnold, in early middle age perhaps, looking speculative and a little untidy. The well-known poverty of his later years may well have factored into many stages of his life. 3-59, “Photographs, James N. Arnold”, James N. Arnold Collection, Rhode Island Collection, Providence Public Library. A folder of photographs of James Arnold claimed my attention. Never married, physically impaired, determined, opinionated to a fault, Arnold was — from what little I know of him — incapable of the fawning demeanor of service that might have made him more valued and protected by Rhode Island’s wealthier classes, who relied on his work. This fascinating photo shows Arnold leaning on the crutches that were his companion during, at least, his later life. One gets an overgrown cemetery feel from the picture but it could be an ancient historical spot. 3-59, “Photographs, James N. Arnold”, James N. Arnold Collection, Rhode Island Collection, Providence Public Library. As time went on, James Arnold found that his life’s work, including his two major publishing ventures, had not ensured a comfortable old age. Late in life he was basically destitute, dependent on Providence’s Dexter Asylum. Well into middle age. Note his possibly disfigured foot. 3-59, “Photographs, James N. Arnold”, James N. Arnold Collection, Rhode Island Collection, Providence Public Library. A set of documents relating to James Arnold’s death make it clear that he tried, as an old man, to dispose of his massive collection of poorly arranged papers. Several important repositories corresponded with him and would have been happy to take them. The choicest books might perhaps have been sold during his life but many books as well as the papers were eventually donated to the library in Elmwood, Providence, that eventually became the Knight Memorial Library. The books, according to Kate, were eventually dispersed among Providence’s library system. James Arnold in 1925, two years before his death. 3-59, “Photographs, James N. Arnold”, James N. Arnold Collection, Rhode Island Collection, Providence Public Library. No one’s work is perfect but it’s notable that no person, in the hundred years since his Vital Record of Rhode Island volumes were published, has systematically re-checked his work in its entirety. No one has been willing to take on the project that he did, and so we all owe this man a great deal of gratitude for a lifetime spent saving our history. James Arnold, looking somewhat business-like, probably at the heyday of his publishing career. 3-59, “Photographs, James N. Arnold”, James N. Arnold Collection, Rhode Island Collection, Providence Public Library. Sunday, October 4 was an exciting day at the Providence Public Library, which hosted the taping of an episode of PBS’ Genealogy Roadshow, to be aired in 2016. Kenyatta D. Berry, Joshua Taylor and Mary Tedesco are the inspiring genealogists hosting the show. Genealogy societies and local historical societies were welcome to exhibit in the main hall where the taping was done. So I represented the Federation of Genealogical Societies, an umbrella organization for the hundreds of genealogy societies around the country that do excellent work and are ready to help with questions. The FGS “Society Hall” webpage can help you find a local society in an area that you are currently researching. The day began at 8:00 a.m. for set up. The crowds started moving in around 9 a.m. and never really stopped. Here are some pictures from this amazing day. The entrance to the library. Lots of tv production folks around all day. They even gave us lunch! In background, Josh Taylor showing some information to a guest. The large screen would be visible to them, but not to others in the room. I have no idea what the genealogy cases were! Helen Smith and Pat Chappell holding the fort for the Rhode Island Genealogical Society. A photographer getting the crowd to show some PBS love. Beautiful Kenyatta Berry, in heels, talking to staff before her filming. Other exhibitors at the filming. The DAR tables were busy, and the Massachusetts Society of Genealogists also helped a lot of people. At the end of the day, Mary Tedesco greeting the exhibitors. This was the Rhode Island Historical Society table. I also got to talk to Mary, she is really nice! Me helping an attendee at the FGS desk. We talked genealogy all day long, and it was a blast! I drive by the First Baptist Church in America regularly, and finally went inside this week for a visit. The church is massive, and lovely. Although it is truly beautiful and historic, it is also familiar, comfortable and welcoming. The First Baptist Church in America, North Main Street, Providence. Photo by Diane Boumenot. The church was founded in 1638 by Roger Williams, who soon moved away from the idea of a formal church and others took over the ministry. A marble plaque inside the church. Photo by Diane Boumenot. This particular building was built in the mid-1770’s, replacing a smaller building a short distance away. I’ve been reading about it in Sons of Providence: The Brown Brothers, The Slave Trade, and the American Revolution by Charles Rappleye (New York: Simon & Schuster, 2006). The Brown brothers Nicholas, Joseph, John and Moses played important roles both in moving the (then) Baptist college from Warren, R.I. to Providence (now Brown University), and in the effort to build the stately new church. The church building served, also, for the college graduation exercises, a custom that continues to this day. Rev. James Manning, educated at Princeton, became the President of the college and also was elected as minister of the church in 1771. Interior view. Photo by Diane Boumenot. I read the Self Guided Tour booklet before arriving, and enjoyed spotting all the historic items mentioned in the booklet. The Self Guided Tour explained many of the features of the church. Photo by Diane Boumenot. The church has a sense of history of course, but it is also an active church community. Photo by Diane Boumenot. While at the church, I asked about a picture I recently purchased of the church; a print from J & F Tallis, London. Oddly, it shows the church with a cemetery in the yard, something that does not exist. The same picture was also in the Manning Room at the church, but the person I spoke to pointed out many inaccuracies in the illustration – no hill behind the church, and no surrounding buildings, which were there very early on. And most of all, no graves should be there. Print of the First Baptist Church at Providence by J & F Tallis. Photo of the print by Diane Boumenot. A little research online shows an estimated date of 1843 for the print. There are other illustrations from that era by other artists which do not contain graves, so clearly this is just a fanciful rendition. But what’s amusing is the eerie, ancient look of the graves – are those two people in the act of interring or disinterring? Is that a skull thrown on the ground? I very much enjoyed my visit to the First Baptist Church in America. No mysteries, ghosts or grave robbers were found, just a beautiful Rhode Island treasure, continuing Roger Williams’ “lively experiment” in today’s world. Well known for their weekly sign on North Main Street, I captured this picture a couple of years ago when Providence celebrated its 375th birthday. Photo by Diane Boumenot. To plan a visit, consult the “tours” page on the church website. Rhode Island researchers will look at the title of this story and say, that’s nice … wait … what? Rhode Island really doesn’t have a State Library in quite the way that other states do. If anything, the State Archives might come closer to what people expect from a state library. But there is a state library located on the second floor of the Rhode Island State House, and I visited it yesterday. This is the story (mostly in pictures) of my visit to the Rhode Island State House, Benefit Street, and the Licht Judicial Center where the Supreme Court is held. Since the Rhode Island State Library is on the second floor of the State House, I traveled to Smith Street, found some metered parking well down the street, and entered the State House for the first time ever. The State House, completed in 1902, is beautiful. I wandered around the first and second floors for quite a while. Note for next time: ABSOLUTELY do not miss the full length portrait of George Washington, painted by Rhode Island native Gilbert Stuart, in the Governor’s State Room. What’s hard to portray here is the unique auditory experience of the State House. There were school children visiting, but their voices and footsteps were heard only as a kind of whirring white noise. It was a windy day, but still I’m not sure why I seemed to be hearing that inside, too. At one point, a piano somewhere could be clearly heard; someone was playing well and loudly. Somehow, the piano and the circulating noises seemed to add to the homey, unique experience of the State House – I couldn’t help but think, I doubt you would hear a piano wafting up the stairwells in the State House of a really large state. But in Rhode Island, we are who we are. The Independent Man is barely visible atop the dome of the Rhode Island State House. This is the back entrance, on Smith Street. The formal entrance faces a large courtyard on the opposite side – I’m not sure whether that is in use. Completed in 1902, the interior is grand and spacious. There is marble everywhere. The State House was filled with memorials to soldiers from many wars. This cannon was used at Gettysburg, with a ball still lodged in it that misfired during the battle. Rhode Island’s 1663 Charter from King Charles II. I had no idea it was so big. What you see here in the protective case is a temporary duplicate; the original is out being spruced up. Then it was time to head upstairs. A beautiful state seal graced the landing. You can see how small the Senate Chamber is. It’s a small state. I love this statue of Rhode Island’s Thomas Dorr. He fought for an extension of voting rights in the early 1840’s. I believe this statue is quite new. I was fascinated by the hallways filled with portraits – mostly of R.I. Governors. The library itself is imposing and beautiful, with two balconies and a marvelous gilt and glass ceiling. I looked over the local books and biographies. This library serves lawmakers, primarily, although the public is welcome to visit. If one were looking for specific records, or even for older transactions of the General Assembly, the State Archives is a better place to visit. The Library itself is rather amazing. a tall room with two balconies. The library is a repository for some federal documents, as well as a large collection of Rhode Island law books and books pertaining to things people might make laws about – health, environment, economics, education, military, social services, etc. The biographies and local histories were quite interesting. The beautiful portraits at the State House got me very curious about finding portraits related to my family. Since two uncles had served as Chief Justice of the Rhode Island Supreme Court, I decided to head to the courthouse. Knowing parking would be quite a problem, I drove down Benefit street until I found a spot, then had a pleasant walk over to the courthouse. Narrow, colonial Benefit Street has cars and snow vying for curbside space. Benefit Street boasts colonial charm and some especially grand historic houses. The Supreme Court is located in the Licht Judicial Complex, a landmark in Providence just to the east of downtown, completed in 1933 at significant expense. The building is ornate and beautiful, with gilding everywhere. A large law library is housed on the eighth floor, filled to the brim with law volumes. There wasn’t a lot for me to do there, but the librarian suggested that any portraits of Supreme Court Justices should be in the seventh floor and I should talk to the guard there. As it turned out, the guard was able to give me a complete guided tour of the whole Supreme Court area. On this tour, I was able to take pictures in some areas (normally prohibited because the building is a working courthouse). 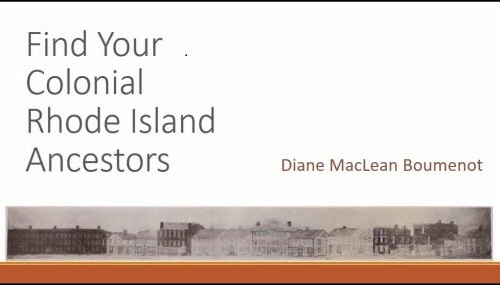 We talked a lot about Rhode Island’s unique place in history and about the portraits. He had a lot of stories about the building and its history. I did find the portrait of my grandfather’s uncle, William Douglas, and I found a copy of Peleg Arnold’s portrait (an uncle who was Chief Justice from 1795-1809 and 1810-1812) although the original is held at the John Hay Library at Brown University (their portrait collection is browsable online). The Licht Judicial Complex, located between Benefit and South Main streets in Providence, houses the Rhode Island Supreme Court and the Providence County Superior Court. One of the first portraits I came across was my gg-uncle’s, Judge William Wilberforce Douglas. He served as Chief Justice from 1905-1908. The Supreme Court – there are five seats. This beautiful room features carved Philippine mahogany. Blind Statue of Justice facing the judges in the courtroom. A judges’ waiting room adjacent to the courtroom. I really got the good tour! I was very happy to spend my afternoon exploring these two historic sites. The State House, in particular, is a fun place to walk through or to take a tour. There is a welcome room on the first floor, or the website, where one can get more information.